This Chinese Orange Chicken Recipe is prepared in a orange shell and cooked by steam. No additional oil, original chicken flavor with orange taste. 1. Cut chicken breast into small cubes,mix with seasoning A. Marinate for 15mins. 2. Clean orange, carve a multi-star cap with the orange peel. Take out the cap.Take out orange pulp. Here we have the orange shell. 3. Add chicken cubes in the orange shell. Steam for 10mins. Serving Method: Serve with steamed rice as main dish at lunch or dinner. Tip: Don't add too much cornsarch, otherwise the meat will stick together. Beneficial Function: Anyone can eat.Suitable for kids and those who are with heart disease and diabetes,etc. 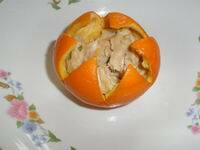 If using tangerine peel it'll benefit those who are with Qi stagnation(dumps,bad mood).